I think I start every post exctly the same: by expressing how happy I am here. I can’t imagine myself being anywhere else in the world but where I am right now: in a country where beer is cheaper than water (score), where daily naps are cultural (double score) and a cold winter is considered 60 degrees. And, yes, my Chicago-bred body has adjusted to this by finding said weather cold and donning a winter jacket, scarf and mittens. No joke. A month back, I took advantage of a Ryan Air sale (even though the airline is scary as all hell to fly…which is probably why everyone claps as soon as the plane lands, post-turbulence, on a clear day). I asked the Huelva girls to come with me to Brussels for the Puente de la Constitucion because I found round trip fare for 32E each – less than it would cost to pay for gas between Wheaton and Iowa City. They showed up Wednesday night about 9pm and we had a beer, turned in, then got up early to take a bus from Sevilla to Malaga. 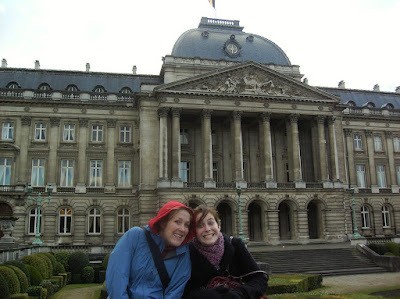 From there, we flew Ryan Air into rainy Brussels, land of waffles, beers and chocolate. I tried my best to starve all week in preparation, but that didn’t work out so well. We got into Brussels Charleroi South airport or something like that, about a 45-60 minute trip from Brussels. Stupid Ryan Air. Despite being cheap, it also flies out of very inconvenient places. Trying to navigate in a country where I don’t know the language makes me feel like a jackass, especially because Americans have a stigma for their reluctance to learn foreign languages. We somehow had good timing to get the bus to the Charleroi train station and a train right away to Brussels’ Gare Midi – central station. 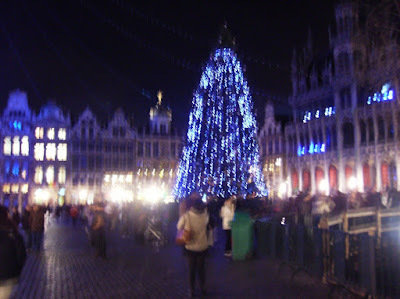 Brussels is a beautiful European city – grandiose, friendly and cold. Cold meaning 55 degrees, but the wind and light drizzle made us all freeeeeeze. I was the trip organizer and tour guide (thank you, Don Gaa! ), and I was the only one who could say more than bonjour or merci in French. Really, I was mildly impressed with my French skills and how much I was able to recall. Somehow, we got onto the metro, which was dirty yet fast, and got off at the stop suggested on the website. I approached about the only person I could find and asked him “Ou’est la Rue Royale?” and followed his finger down the street, running into dead end after dead end. We finally had to ask at a hotel with an English speaker how to get to our hostel after battling drizzle and nighttime temps. When we walked into Hostal Van Gogh, a hostel reccommended by our guide book and one of the only budget accommodations in the city, we were very impressed. The swanky reception area had a bar, a lounge and a pool table. We were told our room was just across the stark courtyard with the bathrooms adjacent. The bathrooms were adjacent, but we had to go outside and share one stall with about 40 other people. When we walked into our practically barren room, we were shocked to find that the bunks had no ladders (I used the radiator to climb), no linens and STUNK. Like, really stunk. My first thought was that it hadn’t been cleaned all week, but it turns out that our bunkmates Lachy and Shawn from Australia didn’t shower. And the smell lingered. We hightailed it out of the room as fast as we could. The boys did us some advice – to see the center of the city while it was lit up at night for Christmas. I normally don’t like Christmas, but I’ve been resisting it a lot in Spain. In fact, people don’t give presents until Reyes Magos day on January 6. Anyway, we grabbed a quick bite at a doner kebab stand and took the metro into town. The cold wind seemed to be blocked by the Christmas spirit. Bars welcomed patrons with a warm fire and cold pints of delicious Belgian beer, the streets were lined with cholocate shops and french fry stands still open after 10 pm, and the plazas were full of lights and music. It sadly made me get into the Christmas spirit. The four of us have become accustomed to walking about 10m in any direction to find a bar or a coffee shop, but we had to trudge through the drizzle for several blocks to find a bar in which to try some of the country’s world-famous beer. We figured we needed to put back a few pints to put us to sleep with the smelly Aussies, at least. What we found was Drug Opera, one of the oldest and most famous bars in the city. Lynn and Jessi ordered Kreik, a wonderful cherry beer that had a little fizz, while Kait got a light beer with the fitting words “Hoegaarden” written on them, and I ordered a darker beer that kind of tasted like candle wax. They were ENORMOUS because when the waiter asked “chopin?” we said yes. He then told us that meant big. Oops. After two of these size, we got on the topics of very inappropriate things, and had to remind ourselves that there are MANY people in Brussels who speak English. Needless to say, we were those Americans and got many, many disgusted looks. But man do I love those girls and the trouble we cause. The next morning, we were up early to a REALLY awful breakfast at the hostel and showers that were in the other building and down the stairs. This was also where the only outlet in the whole damn place seemed to be. I wasn’t concerned about my hair, just my bangs (Yes, I now have fliquillos, the result of a lack of understanding between the woman who cut my hair last week and I. Shitttt. I’m getting used to it, though). We decided that our first stop should then be a waffle stand. 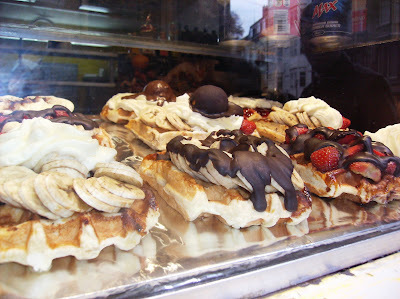 Yes, we were being trite and eating Belgian waffles in Brussels. But they were delicious. So sugary, in fact, that we had to split a sandwich so we wouldn’t be on sugar overload. We took a trip to the Christmas market and tried vin chaud, hot wine with spices, that was marvelous. Delicious. Warms you right up. The streets were so full of people ducking in and out of cholocate shops at 1030 am, and we were drinking wine. Did I mention I think Europe is the best place ever? We got to Grote Market, decorated in Christmas paraphenalia, and just marveled at how intricate the detail on the buildings is, how grandiose and regal everything looks. I love Spain and the architecture here, but northern European cities just enraptures me. 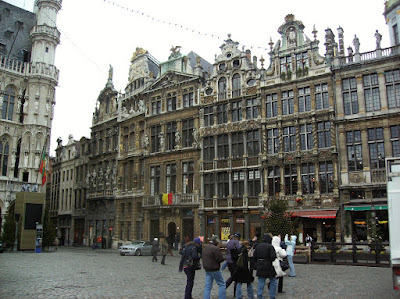 From here, we stopped at Brussels most famous statue – Mannekin Pis, a foot-tall boy perpetually peeing into a pool. The townspeople have hundreds of costumes for him – we saw him both naked and dressed in a track jacket with a strategically placed hole so he could continue to relieve himself. It was quite funny. The wind continued to blow and the rain drizzled on, so we stopped into a bar across from the peeing boy, said to have difussed a bomb by peeing on it, to get more beers. We sat next to a fire and replicas of the statue, and invited two other Americans to sit with us. As it turns out, Sam and Chase are studying in Sevilla and live in my neighborhood. They were kind of strange but super nice. The beer in Belgium really is good, and they take it seriously. There’s like a secret fraternity for it, which we learned at the Beer museum, a spectacular waste of 5 euro. But we got some beer out of it, I suppose. We stopped again on the street for street food – a gigantic sausage with sourkraut and mustard and french fries. 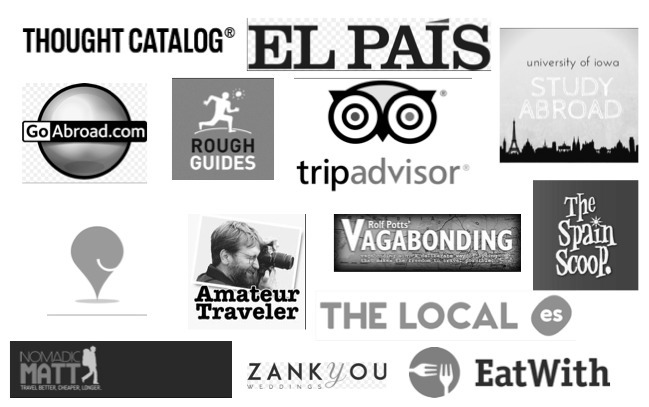 It’s so easy to eat on a budget here, and the food is spectacular. We took a bus out to see the EU parliament building, which is in Brussels along with NATO, but apparently they only give tours during the morning. They probably wouldn’t let us in because we’re Americans, but whatever. We decided it was time to walk back into town and get more beer. Along the way we hit some chocolate places for free samples and got to try all kinds of truffles, pistachio flavored chocolate and practically anything you could think of. I had a hard time picking things out for my roommates and Martin. The first bar we came to we decided to stop in. Who was there but the smelly kids, spreading their stench allll over the city. To be polite, we invited them to have a drink with us, but they sat at the end of the table and told us how much they dislike Americans. Um, ok, you can leave anytime you want? When our broke asses realized we weren’t getting any free drinks, we peaced out and promised to come back after eating. Instead, we drank some more beers at the pita place we went to for dinner, sufficiently buzzed. 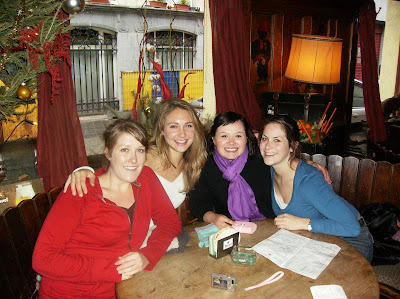 We next went to the Mannekin Pis bar to find more people to hang out with. Deciding it was too much of a hassle to go back to the hostel to chane and look pretty, we figured we could have an easy night and not go to a disco. We found two random dudes whose names I can’t even remember who are in the Royal Air Force in Britain. When we were running out of things to say, we decided to leave for another bar, stopping to get more vin chaud on the way. We soon after got ditched. It was really weird – I went to the bathroom and came out and they were like, “Yeah, we gotta go meet our girlfriends now. Bye.” Uh, what? One of you looks like a neandethal and the other is crossed eyed. And you’re both boring. Anyway, we got over the fact that we’d been burned and made our way back to the hostel at about 10 pm. For whatever reason, we were WIPED OUT. We took a tylenol pm, hoping it would help us sleep, but the stench and Lachy’s Ipod kept us all awake. I would reach across the beds and shake his foot and ask him to turn it off and he would just swear at me. I really don’t like most Aussies who I’ve shared hostels with. With the exception of a 31-year-old we met up north and the girls I met in Ireland, they’re loud and rude and just want to party in Europe. Must be nice to get paid by the government to travel and leave your own country. I got back to Spain in one piece, so happy to be back where I spoke the language and could make excuses for poor service and unreliable time tables. I was feeling sick and just wanted to sleep or shower or something, but Saturday night in Sevilla. I got a phone call from my pal Kate, who told me she was meeting a mutual friend for dinner and then going out somewhere around Triana (Kate lives two blocks from me). The only thing is, this guy is a bit more than a friend to me. I haven’t had a crush on anyone for a long, long time – I mean one that last more than 48 hours – so this is big, I suppose. Kate introduced us a few weeks ago, and I didn’t think it would amount to anything more than me being a bit borracha and kissing him, but we’ve been spending a fair amount of time together. He’s older, 28, and has a big kid job, but despite some miscommunications and my inability to understand the slang he uses, I like him. Even when he disses Brett Favre. I’m not expecting anything to come out of it, as high expectations rarely pan out. For the moment, I’m happy with how things are. With the chaval, with work, with everything. My parents are coming in two weeks and I am getting really excited to see them and Margaret. I can’t believe I’ve been in Spain for three months already! !